Roland DG launched new DTG printer at P&P LIVE! Roland DG surprised visitors to Printwear & Promotion LIVE! last week with the launch of the VersaSTUDIO BT-12 desktop direct to garment printer. Built for on-demand personalisation, the BT-12, which will be available from April 2019, is ideal for businesses looking for new revenue opportunities by offering an engaging in-store experience for their customers. According to Etsuo Harada, division president of COTO Business Division for Roland DG, since the introduction of VersaCAMM SP-300 in 2003, Roland DG inkjet printers have increasingly been used in the production of custom apparel and fabric goods. He said: “More recently, in-store personalisation services for printing customer designs have grown rapidly. 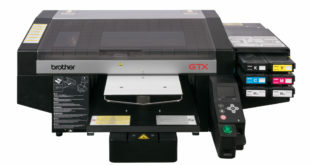 To meet this demand, the COTO Business Division has developed the new DTG printer. The BT-12 is an easy-to-use A4 size printer that prints full colour graphics including photos, logos and text directly on a wide variety of cotton-based items, such as T shirts, tote bags and textile interior decoration products. Its compact size and affordable pricing enables businesses to offer personalisation services with a low initial investment and in locations where space is limited, including shopping malls, kiosks, apparel stores, hotel gift shops and tourist destinations, and even at events. 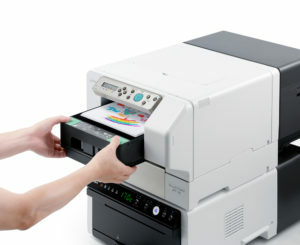 The printer unit requires very little space, with dimensions of 399x760mm , and the optional HB-12 finishing equipment stacks with the BT-12. This clever design dramatically reduces the installation space that is typically required for a traditional direct to garment printer. The BT-12 can be used as a standalone in-store personalisation solution, or as a complement to Roland’s VersaSTUDIO BN-20 printer/ cutter, VersaUV LEF Series UV- LED printers and the LD-80 digital foil decorator. These solutions not only help to add value to merchandise, but also provide customers with a rewarding new shopping experience. Mr Harada added: “Consumer behaviour has been shifting from consumption to experience due to the diversification of consumer values. As a result, businesses have an opportunity to offer high-value merchandise such as personalised products to meet customer needs and desires.